The “RNA world” hypothesis is seen as one of the main contenders for a viable theory on the origin of life. Relatively small RNAs have catalytic power, RNA is everywhere in present-day life, the ribosome is seen as a ribozyme, and rRNA and tRNA are crucial for modern protein synthesis. However, this view is incomplete at best. The modern protein-RNA ribosome most probably is not a distorted form of a “pure RNA ribosome” evolution started out with. Though the oldest center of the ribosome seems “RNA only”, we cannot conclude from this that it ever functioned in an environment without amino acids and/or peptides. Very small RNAs (versatile and stable due to basepairing) and amino acids, as well as dipeptides, coevolved. Remember, it is the amino group of aminoacylated tRNA that attacks peptidyl-tRNA, destroying the bond between peptide and tRNA. This activity of the amino acid part of aminoacyl-tRNA illustrates the centrality of amino acids in life. With the rise of the “RNA world” view of early life, the pendulum seems to have swung too much towards the ribozymatic part of early biochemistry. The necessary presence and activity of amino acids and peptides is in need of highlighting. In this article, we try to bring the role of the peptide component of early life back into focus. 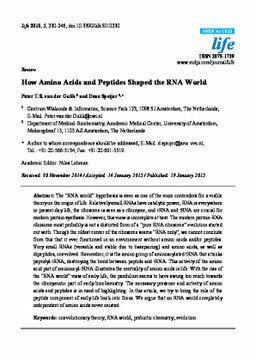 We argue that an RNA world completely independent of amino acids never existed. van der Gulik, P.T.S, & Speijer, D. (2015). How Amino Acids and Peptides Shaped the RNA World. Life, 5(1), 230–246.